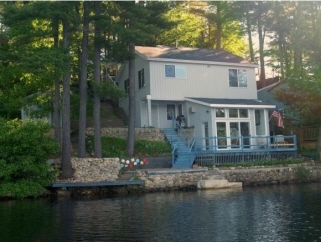 WATERFRONT UNDER CONTRACT in 7 DAYS! Complete renovation/addition in 2006. This is a MUST SEE! Private get-away! Designer customer kitchen with tile floor, large granite island, high end cabinets with corian counter tops, recessed lighting. Radiant heat, master bedroom with double closets and large master bath. 2nd bedroom, guest style, private with 3/4 bath. Mid-level living room with built-in entertainment center. Hardwood floors, gas fireplace, office area, plus covered porch. Lower level sunroom. Large attached deck, additional patios and boat dock. Landscaping with waterfall and retaining walls. Full attic for storage. Detached 2-car garage. Beautiful views of the lake and mountain plus much more. Lots of summer FUN! Make your appointment today and start enjoying lake living on Glen Lake!